“​Anacaona” by Marie-Agnès Sourieau, Ph.D.
"​Anacaona" by Marie-Agnès Sourieau, Ph.D.
Sourieau is Professor of Modern Languages and Literature at Fairfield University. She co-edited Ecrire en pays assiege (2004) and Caribbean Creolization: Reflections on the Cultural Dynamics of Language, Literature, and Identity (1998). According to the Spanish colonial chronicle, the island of Ayti, in 1492, was divided between five kingdoms populated by at least one million Indians. 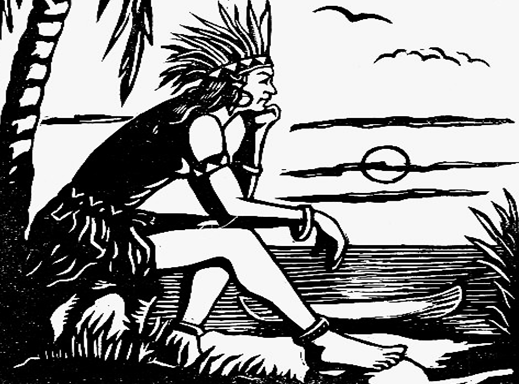 The Cacique Caonabo (Gold chief) reigned over the kingdom of Maguana while his spouse, the radiant and refined Anacaona (Golden flower), a poet and a musician, ruled over Xaragua. When in 1500 the administration of Hispaniola was handed over to Nicolás Ovando, Christopher Columbus’ rival, the native population was enslaved to the harshest labors and forced to pay exorbitant tributes. Within ten years, the Indians would be near extinct, except for those living under Anacaona’s sovereignty. Indeed,the kingdom of Xaragua was not fully controlled by the Spaniards although it owed them tributes. Fernández Oviedo, Hispaniola’s first historian, recounts that Queen Anacaona was "courteous, of noble speech and manners, and the Christians’ loyal friend". This genocide would never be forgotten, slowly becoming the metaphor for the island’s tragic destiny, and Anacaona, the mythical figure essential to the Haitian’s collective memory.